In this case, a deletion happened. "Bright" was deleted by the ASR. In this case, an insertion happened. "Bright" was inserted by the ASR. In this case, an substitution happened. "Bright" was substituted by "light" by the ASR. As only addition and division with non-negative numbers happen, WER cannot get negativ. It is 0 exactly when the hypothesis is the same as the reference. WER can get arbitrary large, because the ASR can insert an arbitrary amount of words. Interestingly, the WER is just the Levenshtein distance for words. 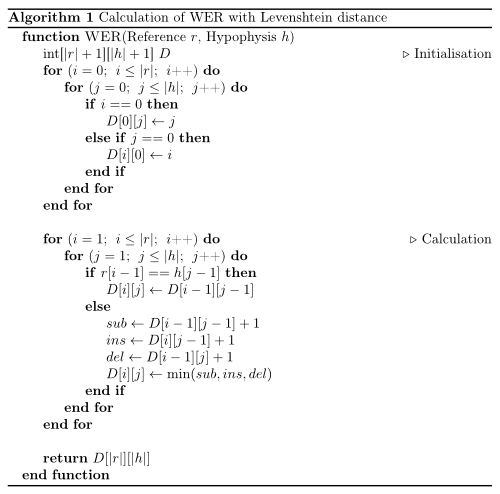 Calculation of WER with Levenshtein distance. Works only for iterables up to 254 elements (uint8). O(nm) time ans space complexity. If it was an insertion, then the hypothesis will be longer than the reference. So you can delete one from the hypothesis and compare the rest. As this is the other way around for deletion, you don't have to worry when you have to delete something.